Beside the unique clothing style, rockabilly culture has its own pinup makeup rules which make it complete and recognizable. Prominent lipstick, emphasized eyes and adorable dolish look give this style a special note. Pinup girls usually look like their makeup is done by the professionals, but it doesn’t necessarily mean that it is. When you know the basic rules, you can easily switch your previous makeup style to the glamorous rockabilly/pinup makeup. We have some practical tips for you to help you build up your vintage fashion getup. 1. First of all, you need to keep your skin healthy and implement the adequate care. Healthy skin is beautiful skin. Pinup makeup make you look like a living doll, so the pure skin is desirable. When you have good skin, it’s easy to choose the base makeup. Usually, retro looks imply the pale tan, but it’s not a norm. Choose whatever you think goes best with your natural tan. 2. When your base is ready, you can put some blush. 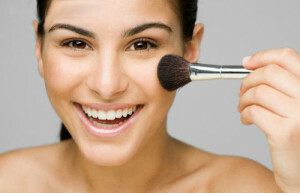 But be careful, because sometimes blush can look as exaggeration, especially when your eyes and lips have strong and prominent makeup. After all, as it’s mentioned, pin up mostly implies a pale tan. 3. Eyebrows are extremely important, since they really visually affect the shape of the face. 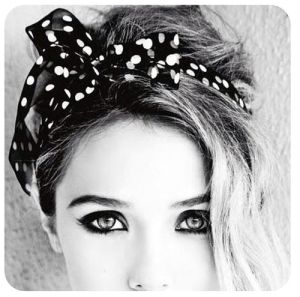 Rockabilly girls prefer stronger and thicker eyebrows with natural line. You can always boost them with an eyebrow pencil. It’s important to use the color similar to your eyebrows color. Also, if you dye your hair, keep your eyebrow color matched with the hair color. Speaking of hair, you can always decorate it with a hair accessory, and we’re at your service with a splendid retro collection. 4. When it comes to eyes, pinup makeup comes to the fore. Vintage ladies use a couple of tricks to make eyes specially highlighted. First of all, you can put some light eye-shadow similar to the skin color. Apply it all over the eyelids, up to the eyebrows. You can make it darker right above the eyelashes. Then you can apply the eyeliner. Pencil eyeliner is probably the easiest and the fastest way. Put it along the eyelid and then lift it up aside and you’ll get something like cat eyes. 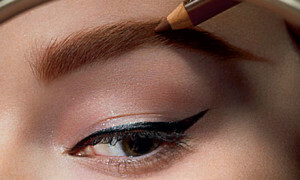 Optionally, you can also use a black shadow and eye pencil. Black mascara can also give you a special effect. 5. Fiery-colored lips are the trademark of pin up makeup. No matter will you choose the flaming red, bright orange, maroon or other color, your lips will draw the most of attention. So, try to choose a high quality lipstick and choose it by your own aspirations. Also, avoid the glossy and take the matte lipsticks. And your vintage pinup makeup is done! Step by step, you will develop your own variations of this classic pinup makeup model. This practical set of rules is convenient for everyday occasions and for evening happenings, so we’re sure you’ll be happy to try it. But pinup makeup is just the crown of style. To complete the rest of the pin up puzzle, visit us and explore our collection of rockabilly women clothing.